I know what you must be thinking, Fish and Tacos, good separately, but they just don't mix. Well, they do. 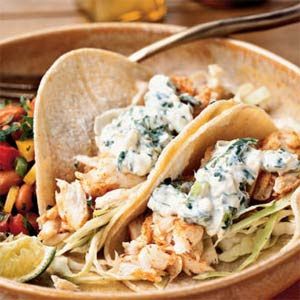 Ever since I had fish tacos a couple of years ago at The Cheesecake Factory in Jacksonville, Florida, I have been a big fan of these and wanted to make them at home. This recipe was really great. My kids love fish, so they really like these. I used tilapia instead of red snapper and the spices on the fish are mild enough for kids. What really makes this dish is the Lime- Cilantro crema. It is delicious. So give it a try, if you dare!